This week Doritos released new, limited-edition rainbow-colored chips to celebrate and support the lesbian, gay, bisexual and transgender (LGBT) community in “the boldest, most colorful way possible” in partnership with the It Gets Better Project. Doritos Rainbows were available by mail after a minimum donation of $10 to the It Gets Better Project and promptly sold out within 24 hours. The Doritos brand will sponsor the Dallas Pride event on September 20 where the Doritos Rainbows chips will also be available to people who pledge their support to the cause. There is so much to admire about this #BoldandBetter campaign from Doritos. 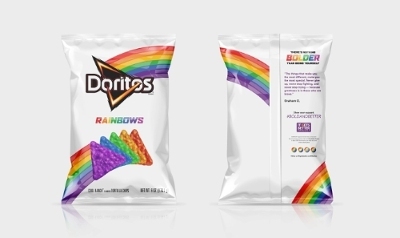 Taking an iconic snack food like Doritos and dramatically changing both product and packaging displayed a strong show of support for the LGBT community and commanded instant consumer attention. While not a tactic commonly employed, requiring a minimum $10 donation to its nonprofit partner on a limited edition product was a winning combination, again showing strong support for the cause. All around, an engaging, creative effort from Doritos and the It Gets Better Project that earned attention, buzz and action.